East Libya’s Ministry of Education is edging closer towards its western counterpart. 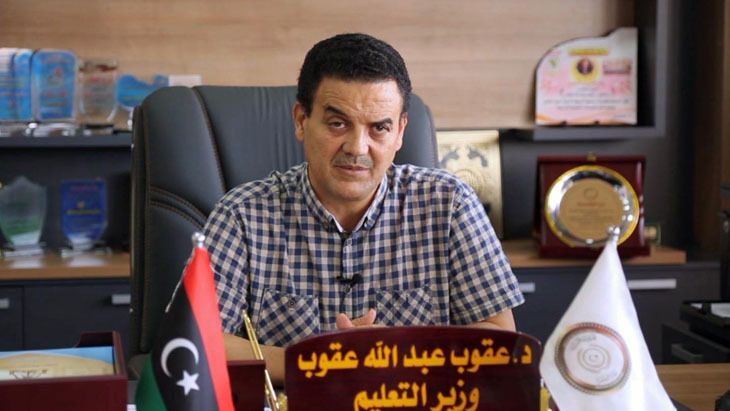 Libya’s Ministry of Education (MOE) announced that it has embarked on a preliminary plan, in cooperation with UNICEF, to reboot the educational system in Libya and start supplying mobile classrooms to Benghazi. Correspondents spoke to Minister of Education Dr. Abdullah Agoup, in charge of schools in the eastern region, about rebuilding and improving the education system after years of civil war. Dr. Agoup, what does the plan for schools entail ? UNICEF’s Libyan representative told me UNICEF is interested in assisting the affected areas, including Benghazi. I said the interim MOE is ready to extend every effort to facilitate UNICEF’s work. We agreed to provide about 400 mobile classrooms this month to Benghazi and we agreed to undertake their assembly and transparent distribution to schools in need. The GNA Minister of Education requested you to work with him from Tripoli during a televised interview and you agreed to cooperate. You also recently decided to arrange a meeting between the representatives of the two ministries at the educational curricula centers, and the offices of educational inspectors and educational department officials. Will there be more unity this year, including uniformity of curricula and examinations? Yes, we paid a seven-day visit to Tripoli to unify curricula all over Libya, and we have recently agreed to postpone study until 15 October, following direct contact with the curricula department director, who informed me that the text books would be delayed. Therefore, we agreed to start the school year on the set date, so as to start study together, in addition to the holidays, examinations, curricula and closing date. The director of educational curricula expected that 39 million school books would be delivered before the end of September. Can you tell us how this process will be carried out and at what cost? The MOE is responsible for the printing of the books and we are awaiting the distribution process. We printed and distributed the books last year all over Libya. According to the available information, the books were printed in Egypt and Italy and L/C has already been opened. The printing cost last year ranged between LYD 45 and 50 million, while this year’s cost is said to be nearly LYD 80 million (USD 58 million). Large amounts of money are spent every year on printing of books, which are burnt at the end of the school year. Do you think there are other alternatives? I am against book printing on a yearly basis. Last year we decided not to deliver the school report card to the students unless they handed back their books in a bid to keep the school books and use them the following year instead of burning them, and to prevent smuggling these books outside Libyan borders. Besides, books can be electronically accessible through adequate classroom methods, so as to save large funds for the state budget. We need to develop new cultures in our society, including discipline, responsibility and love of the homeland among citizens. A ministerial decision was released by GNA senior officials about offering foreign scholarships to excelling students. A similar decision has been also promised for students in your areas. Has this action been coordinated with you? No coordination has so far been made in this regard, as financial mandates are issued in Tripoli. What is important to me is to dispatch excelling students for study abroad and encourage these students in other areas. This is also an encouragement for the new students as well. If such decisions are not yet issued, our ministry will issue scholarships for these students, based on the available budget. For the first time, the number of excelling students at the GNA MOE at the scientific and literary sections has reached 44 male and female students, while in your area there are 31 students. Have these figures been exaggerated or are they considered a positive indicator? The order of repeated first excelling students has existed before, and this year’s paper marking is automated, which explains the relative similarity in number. However, this year’s examination will be standardized including the first ten qualifying students at Libya’s level, which is a more adequate action. The success rate in your schools has reached 66.41%. How do you read this percentage, given that it has declined in comparison with the rate in the GNA areas? I believe that this rate is an indicator for accuracy and control in this year’s results. We have intercepted the culture of examination leaks. And, students staged protests when we ordered strict actions against violators. We have also cancelled and repeated leaked examinations. This has led to considerable reduction of cheating practices. It is a percentage that has not existed for some time and is considered a positive indicator. Many people have objected to the decision to publish the names of students who were caught in cheating cases, describing it as a non-pedagogical action. What is your opinion about this? We repeated the leaked examinations and the results were acceptable, and we have not published any names, because students might have been in a poor educational situation or unaware of their future. These cases need to be addressed in a wise and more educationally oriented manner. We decided that penalty should be internally applied without publication of names. The officials who were responsible for the examination leaks were referred to the concerned security authorities for legal action. We have a special disciplinary committee whose decision has to be implemented even if it provides for dismissal of the violating student. In this case only, the relevant decision will be published. The GNA’s MOE has allocated special funds for the new school year, according to a statement by the ministry’s undersecretary. Has this applied to your schools? We have a different viewpoint regarding this issue. If this action aims to deliver and facilitate services, we have no objection, stipulated that the allocations should be distributed to the deserving areas, far from directors blackmailing and personal presence of the concerned parties, where they receive and sign the allocations and be photographed with them so as to win their allegiance. If their intention is good and the purpose is assistance, they can deliver the funds to the educational areas that enjoy financial independence and distribute the funds to the schools. They may also transfer the funds to the ministry’s account and we will undertake their distribution to the deserving parties. This also applies to the universities, where they can assist ten universities under our ambit in the same manner. Do you support the demand to activate the teachers’ class allowance instead of the teaching allowance, and will GNA’s education minister’s decision apply to all teachers in Libya? We issued the decision last year and GNA ministry issued it this year. We demanded to give more attention to class teachers, and proposed to the council of ministers that the allowance value at primary, intermediate and secondary education stages should be LYD 15, 12 and 13 respectively. We have exceeded the allowance and demanded the parliament to promulgate a law on increasing teachers’ pay, like the other citizens employed in the other sectors. Do you think that the Social Security Fund that has been recently adopted by the GNA MOE to improve teachers’ conditions viable? It aims to promote the spirit of cooperation among the education sector’s personnel. This fund existed before, but regulations and mechanisms for controlling its internal action have now been introduced. It also existed among the teachers in a spontaneous and less organized manner before. At present, efforts are made to further expand this fund so that it covers larger numbers. It is a good thing that benefits the teachers, although pay increase is a solution to the problem and more viable than creating a fund that acts as a sedative that alleviates suffering. Are your teachers’ salaries paid from your budget? The interim Libyan government spends LYD 400 million (USD 292 million) a month in salaries, and the funds received from Tripoli for the central departments are very limited. The salaries are transferred from Al Bayda Central Bank to the Finance Ministry, who will in turn transfer to us. Teachers’ salaries from GNA government have stopped, which prompted the interim government to provide their salaries by central banks’ borrowing from the commercial banks. What is your vision regarding the urgent educational problems? We have 30 educational areas operating under our ambit, and the districts or municipalities have educational facilities overseeing about 500,000 male and female students in more than 2000 schools. We have received requests to join us from densely populated regions, like Tarhuna, Warshefana, and Ajaylat. Educational problems are manifold, deep and very old, and teaching depends on the three well-known components of the teacher, infrastructure, manifested in schools, libraries, audio-visual tools, and the curriculum. These components must be provided to allow the educational process to run smoothly. Unfortunately, this three-element requirement, starting with the teacher, who is underpaid and is deprived of medical security, rehabilitation, and training, coupled with intrusion of many unprofessional teachers, has badly reflected on the teaching process. Improvement of teachers’ conditions is the responsibility of the government. In addition, the infrastructure is dilapidating, where many schools still lack the basic needs and services. They are without doors, windows or even lavatories. There are many shack schools in the east, west, and south of the country that have existed for the past 40 years. In addition, schools overcrowding is another serious educational problem, due to scarcity of schools, where number of students in classrooms reached up to 50 and 60 students. Maintenance must take place as soon as possible. The interim government has spent LYD 1.5 million, while the GNA government spent LYD 2 million on a single school. Nevertheless, we are working in accordance with the affordable budget, and are awaiting budgetary allocation from the Central Bank of Libya in Tripoli after it has been approved by the parliament. The third element (the curricula) does not represent the Libyan structure and is imported from Singapore, a leading state in the educational field. The environment there is readily available, unlike our environment that needs to be reconstructed and adapted to our curricula. For example, they apply full study day, while we teach the same syllabus at half the time earmarked for teaching the book. Their well-equipped laboratories are still lacking in our schools. Now after the expected national unity, there will be one government that deals with the same central bank, and the government can achieve all that is needed without delay. After all, education concerns every Libyan family and must be far from political conflicts. en-ly: "We Need an Active Customs Apparatus." en-ly: Did Gaddafi Officials Inject Children With HIV? en-ly: "There Are Patriotic Persons We Trust."